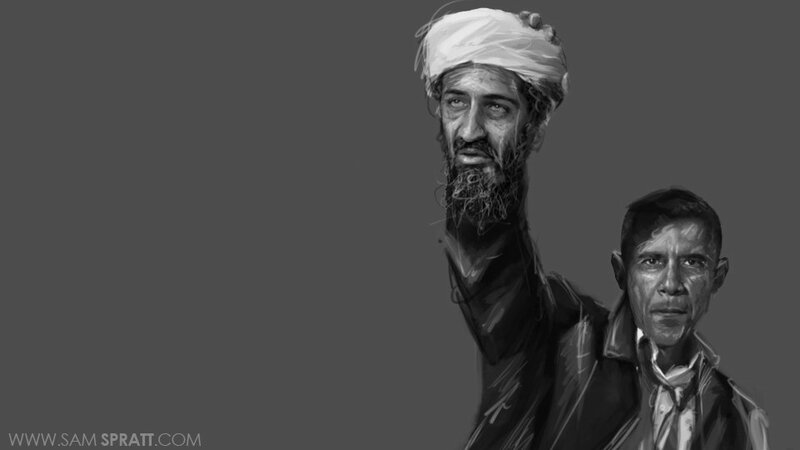 Have photos of Osama been released yet? Until then I'm remaining skeptical. Especially since silly Fox News can't even decide who's dead: "Obama Bin Laden was killed today." Imagine that you are the most wanted terorrist in the world, the UN officials have been in search for you for 10+ years, then you hear that the US is giving you a clean slate to start your life with, you have been declared dead so you can now start a new life with a new identity. Would you make a video saying that the US are lying and you are alive or would you relish your freedom? Answer's quite obvious. Exactly. Infact, if you think of the mindset of a Briton at the moment, the British have been enjoying the royal wedding this weekend and the far east is aware of this, they won't be very happy about it. 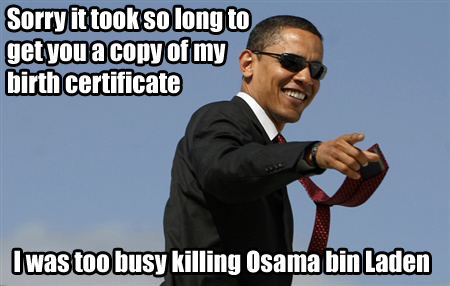 To add to it, Obama declares Bin Laden dead on a holiday weekend to give the British something else to celebrate about. The last time the British were this happy with the olympics, we had the 7/7 bombing the next day. If there was a firefight, how did the officials then manage to get so close to Osama so as to aim a clean shot at his head? His birth certificate has been released. “Susan Nordyke, the first twin, was born at 2:12 p.m. Hawaii time Aug. 5, 1961, and was given certificate No. 151 – 61 – 10637, which was filed with the Hawaii registrar Aug. 11, 1961. You really think subliminal messaging doesn't work? Its in all the blockbuster films and music videos.. Believing something exists does not make it real... much like religion. Why do some people not see the importance of a burial in the sea!?!?!?! First and foremost, it removes the need for a grave which may become a shrine for terrorists. Basically, he is not martyred in the physical sense. It is also completed within 24 hours which respects the Islamic Religion traditions. It may arouse conspiracy but it is perfectly sensible and necessary. A man who has been a terrorist for so many years and probably near his death (IF he was alive) would not accept a clean slate start, especially from the USA. A man like him would rather die. He is dead. My only question is when and how. It wasn't yesterday. First and foremost, it removes the need for a grave which may become a shrine for terrorists. Basically, he is not martyred. It is also completed within 24 hours which respects the Islamic Religion traditions. He's still a martyr, but it doesn't give his followers someone to go to mourn/celebrate/whatever. Either way, it's a good thing they did it. But it's going to get the foil hats stirring. http://twitter.com/#!/reallyvirtual a guy tweeting about it all without realising! Too true. Undoubtedly, this unorthodox burial will make some suspicious but the thinking behind is totally rational to not deal with the complications a physical grave would bring. If I die because of this, I swear down, I'm telling God. He's Gizmodo's resident artist isn't he. Yeh the way he was buried was the most rational way to do it. Bury him in the ground and you'll have problems with pilgrams visting and probably trying to take his body back. Cremate him would leave the difficulty of where to cremate him and what to do with the ashes and what implication would it have keeping his body in a certain country for a short period of time. So the best way to essentially dispose of him is to dump him in the deep sea, where no one can get to him and no one will hold resposibilty of his body. I wake up and I find this thread! This really a wtf moment right now! And what does a clip show prove?